Working under Drs. Gary Bennett and Dori Steinberg, Jamiyla provides high-level administrative management and support for programmatic development of center studies and programs at the Duke Global Digital Health Science Center. In addition, she directs a large-scale NIH funded study -- Charge -- and an implicit bias training project in the Duke Center for Research to AdvanCe Healthcare Equity (REACH). 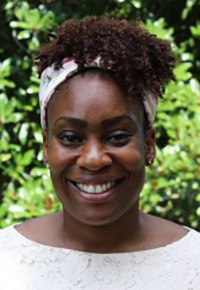 Prior to joining DGHI, Jamiyla was a research health science specialist at the Health Sciences Research and Development department of the Durham VAMC for 11-years. She received a bachelor's degree at UNC-CH in Exercise and Sport Science with a biology minor, and her master's degree in physical education and health from NCCU.